For many years now my knitting philosophy has been "off the needles, and around my neck" . . With TWO very pertinent steps missing, basically due to laziness on my part . . . Swatching And Blocking! Yes, I know I should always do a gauge check but usually I can be flexible enough to adjust my perspective and "accept" the results of my living-on-the-edge knitting adventures. However, I am learning time and again just how good, actually, things look once I have blocked them - like the instructions tell me to do! So... Let's consider some Blocking tips that will help change things from a quick little knitted so-and-so to a professionally finished garment! first off, you need to gather up a few things to make this endeavor a success, and ultimately a HABIT! 1. A PLACE to block, whether it be your dining room table or an ironing board or even a designated spot on the floor. You will need room to let your knitting bloom and dry... To rest undisturbed so that it's hidden beauty will be revealed. 2. A water source. Will you be doing a complete wet block or a mist and pin option? Different strokes for different folks, but each one has it's appropriate place. Do you have a sink close by ... or a water bottle that is filled? Towels to absorb the moisture, a waterproof backing on your work surface??? 3. Pins. Some people prefer straight pins while others go with T pins. Regardless, make sure they won't rust! 5. Something to measure with -a tape measure (though they can stretch out) or finally a practical use for the yard stick that's been sitting in the corner forEVER! Once you've got these gathered up it's time to start the "process". 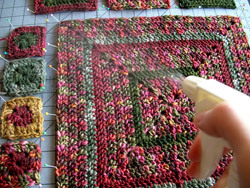 I have learned over the years that this is not a QUICK process either ... as in, it's really hard to finish the scarf, spritz, pin and steam it and then think that i really can wear it all the time span of 7 minutes! I promise that i have, indeed, tried to apply the hairdryer to a scarf or two in hopes of expediting this process .. and i assure you there is nothing comfortable about wrapping a wet scarf around your neck and trying to smile graciously at the same time it is dripping down your shirt collar! Blocking is really the tell tale sign of a garment well made. It is the final piece of the puzzle that characterizes it as "finished" ... and truth be told, i think it also is a sign of confidence in the workmanship - being willing to invest that last little, but so integral, step in order to proudly display and reflect all the time invested. If you only look at us, you might well miss the brightness. We carry this precious Message around in the unadorned clay pots of our ordinary lives. That's to prevent anyone from confusing God's incomparable power with us.